Fuji has introduced a new tough camera, the XP60, and a long-zoom camera, the T500. The Fuji FinePix XP60 features a 5x optical zoom lens and a 16 million pixel 1/2.3-inch CMOS sensor. It's capable of shooting at up to ISO 6400, and comes complete with CMOS Shift Image Stabilisation for helping to eliminate image blur. It also has a number of rugged qualities. It is waterproof down to a depth of 6 metres (19.7ft), with a double seal over the battery chamber for increased protection. It's also shock-proof from a height of up to 1.5 metres (4.9ft) and freeze-proof down to -10C (14F). Sealing also means that the camera is sand-proof. On the Fuji XP60 is a 5x optical zoom lens, providing an equivalent focal length of 28mm-140mm. Intelligent Digital Zoom is also available to double that range. Full HD video recording and 10fps continuous shooting is also included. For those looking to get a little creative, Motion Panorama 360, HDR shooting and digital filters (such as Toy Camera) are available. Fuji has also announced the T500 travel compact, boasting a 12x optical zoom lens with Optical Image Stabilisation to compensate for camera shake and subject blur. The camera has an ultra-slim design, being just 18.6mm at its thinnest point, with the camera ranging from 24mm at the wide end, going up to 288mm at the telephoto end of the lens. Digital zoom is also available to boost the potential of the lens up to 24x. 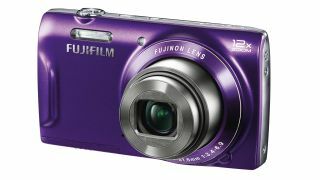 A 16 million pixel CCS sensor is included, with the Fuji T500 able to shoot images at up to ISO 3200 and record video at 720p HD. Advanced Filters enable you to use a bit of creativity, with digital filters such as Pop Colour, Toy Camera, Partial Colour and so on available. Pricing and availability for both cameras have yet to be announced.